4-Piece Bathroom Accessory Set Only $2.24! Down From $5! You are here: Home / Great Deals / Christmas Deals / 4-Piece Bathroom Accessory Set Only $2.24! Down From $5! 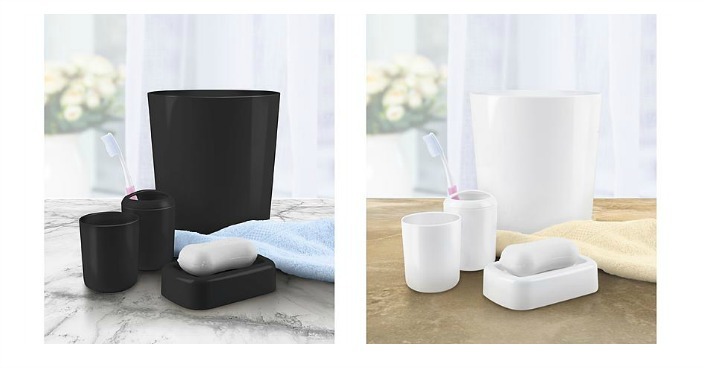 4-Piece Bathroom Accessory Set Only $2.24! Down From $5!0! Kmart has this 4-Piece Bathroom Accessory Set on sale for $2.24 (Reg. $5)! Bring fashion and function to any bathroom by adding the 4-piece Accessory Set by Essential Home. It comes with a garbage can, soap holder, glass and toothbrush holder all in a color that will blend in nicely with any decor. Accent a vanity in an ensuite or guest bathroom with this stylish accessory set. Final: $2.24 PLUS FREE in-store pickup!